10m fiberglass pole with reinforced design. 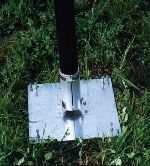 Dimensions comparable to the standard mast, but significantly reinforced. At the reinforced masts the innermost tube has a diameter of 10mm! The bottom diameter is 43mm. The wall thickness of the tubes are significantly increased: the lowest tube has 2mm wall thickness, the second Pipe from above still 1mm. Total length >10m pushed, 1.17m. Weight 1.7 kg. Our simpler telescopic fibre glass masts have the same rigidity as the original, but no friction zones and not reinforcements at the end of each tube, no cloth bag as with the original. 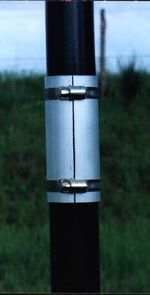 Length retracted 1m, extended 4, 6 or 10m. 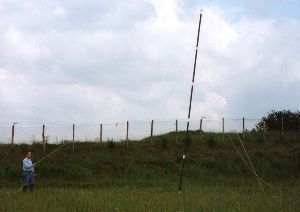 Short, but strong mast, extended length 6m. Very robust: diameter at top 4mm. Can hold lightweight antennas such as HB9CVs or our SOTA-Antenna (Order No. 18503). Versatile carrying bag for portable masts, antennas and accessories. The carrying bag 18335 is very well suited to transport and store multiple portable masts, collapsed antennas for VHF or shortwave, cables and other accessories. The bag has three separately accessible compartments which stretch over the entire length of 116cm. The inner size of each compartment is 6 x 19 x 116 cm, suitable for multiple glass fibre masts, VHF yagi elements, dipoles, coaxial cables or collapsed boom tubes. On the outside three smaller bags with sizes of 13x70, 13x59 and 13x24 cm are applied, each has a depth of 4cm. This is helpful for separate packing of smaller accessory parts like brackets, screws, adaptors etc. The carrying bag has carrying handles on one side, on the other side long, adjustable belts. With these belts the bag can be carried like a back pack, for example on mountain tours where you need your hands free. The materials (synthetic leather and snthetic fabric) and quality of the bag is good and robust, the handles of the zipper fasteners are long enough tio be used even with gloves. Total weight (empty) 1100g. Colour black with silver/white applications on the outer bags. Low weight, very solid lower sections (73mm diameter, 2mm wall thickness), in 10m height still 50mm diameter at 1.5mm wall thickness. Light segments on top (1mm wall thickness) for good balance. The reinforced laminating technique - many layers of fibre glass in different directions - results in significantly stronger segments. All masts are supplied with a free stainless steel clamp set. Solid construction with low weight and only 2m transport length. The fibre glass tubes are black and UV resistant, wound with multiple layers and reinforment rings. The wall thickness is 2.mm on the lower end, and 1mm on the upper end. The installation can be done by two persons in about one hour, with a little practice also faster. Included in the shipment are 14 rubber-padded clamps and three guying rings. Additionally you will need gyuing lines, e.g. our light 3mm Dyneema rope (Ref. 23100), plus material to fix the rope to the ground (ground pegs etc.). 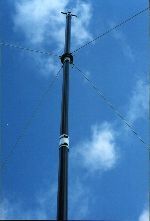 The masts are made of ultra violet resistant fiber glass telescopic pipes of 1.5m length and 60mm diameter; they are much more rigid than compared to the well know aluminum masts. 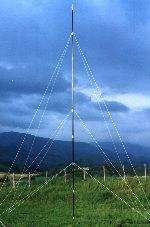 The masts are available in various lengths up to 12m togther with the required fittings. 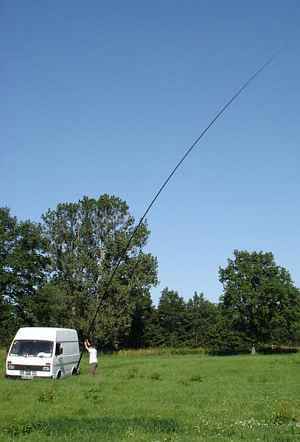 By means of three additional sections the mast can be extended up to 12m. An appropriate guying rope is available for the extension to 12m.